MmmMMmMMmmMMM! Feel the bite! 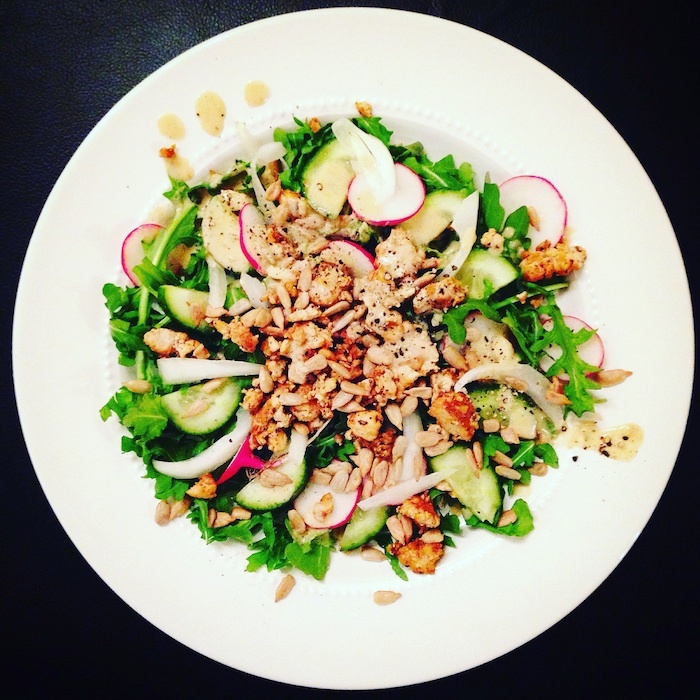 The combination of Arugula, Radishes and ample cracked Black Pepper makes this salad SPiCY! The Sunflower Seeds and Onion give it a crunch and the Tofu adds protein. Yes, this salad has it all. Pour on the creamy Tahini dressing and you’ll be in heaven! Let's start with the tofu! Crumble with your hands into a small non-stick skillet. Cook all of the excess water out on high heat. Then add Nutritional Yeast, Soy Sauce and a generous amount of cracked Black Pepper flipping around a few times to make sure the tofu is evenly coated and cooked. Set aside. Chop the Cucumber, Onion, and Radishes for the salad and the Garlic Clove for the dressing. In a small bowl, combine Water, Tahini, Olive Oil, Apple Cider Vinegar, Garlic, Salt Black Pepper and a dash of Turmeric. Using a small whisk or fork, stir swiftly until smooth. Divide the Arugula onto two plates. Add all of the chopped toppings, tofu, and sprinkle the Sunflower Seeds over the top. Serve with Tahini dressing!